Our new house, like every large project requires a lot of work to set things up before the real work of building can start. We've been busy. The building plans are almost done, the engineers are working on the building specs for the footings, concrete walls, structural steel, roof trusses, heating system, ventilation system, septic system and all the other things engineers need to do. We've dug the test holes for soil tests and the perk tests. Yesterday we took down the old fence that separated the front yard from the back yard and then rebuilt it fifty feet to the rear. That will make room for the massive pile of soil we will dig out for the foundation. Today's job was to remove two trees that were where the new house would be located. Both were large and well beyond their prime. The largest was hollow and soft through the center. We'll plant some new ones to replace them after the new house is built. Trees grow pretty fast in these parts! My good friend and neighbor Gord came to help me with the falling. I manned the tractor which was tied to the tree to make sure they fell in the right direction - away from the old house! We need it just a little longer. The biggest branch was the mst worrysome. We tied a rope as high as I cared to venture and then pulled as hard as my little tractor couldmanage. Gord handled the chainsaw and it came down with a couple of feet to spare on both sides. Then it was time for the biggest section of the tree. 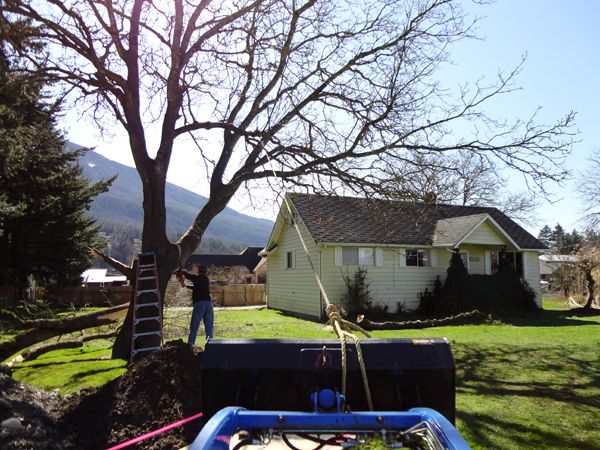 We sized up every option and considered a number of plans before deciding to drop the tree between the fence and the old house. Gord fired up my trusty old chainsaw and went for broke. What could possibly go wrong? The ancient walnut tree came down perfectly, this shot capturing the scene just before it hit the ground. It missed the fence and the old house in the process. The last obstacle for the new house is now gone. From here on in we build new instead of dismantling old.